This article has been tagged as Needing work due to its poor writing. McJuniorBob is a live-action series that aired on Nickelodeon and promoted by McDonald's. The show aired around 2008-2010 in the Netherlands. McDonald's and Nickelodeon created a show about a bald man called Bob. Not much is known about this show as all episodes are currently lost and not many people seem to remember it. The only thing confirming it's existence is a promotional website for the show called McJuniorClub. A Dutch person talking about their distaste of the Christmas episode. (Translated: My god, it's horibble... Check out this video of 'BOB' as a Christmas tree. It's not surprising the Dutch youth does drugs on a large scale, when you serve them this kind of meaningless, sad, advertorial trash. Website when it was available. Screenshot of the show on the video page. 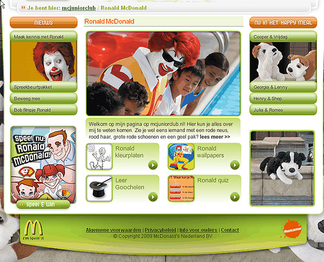 The Ronald McDonald page where the show is mentioned. Screenshot of the Christmas episode. 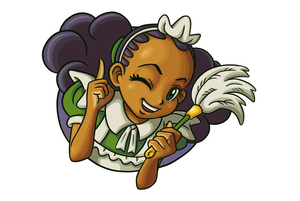 Screenshot of the Sinterklaas episode. Screenshot of the Endangered Animal species episode. The Lost Japanese Mcdonald's Commercials, some lost commercials from the fast food brand. Ronald's Adventure Machine, a found birthday party film from the fast food brand. YumChums Commercials, partially lost commercials from the fast food brand.